A Tallahassee native, I graduated from Chiles High School in 2009, received my AA from Tallahassee Community College and then transitioned to the Flagler College Tallahassee campus where I obtained a bachelor’s in Business Administration. I have been working at Benson’s Heating & Air Conditioning in some capacity for going on 14 years, beginning as a part time warehouse helper, slowly working my way up. During those years I’ve gained experience in receiving and stocking, commercial fabrication, welding, parts delivery, as well as residential install and service. The most recent years have been dedicated to commercial estimation, creating and spearheading our loss prevention department as acting Safety Director and taking on commercial projects as a project manager when needed. 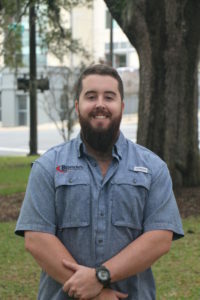 I am currently working toward earning my Florida Mechanical Contractors License this year and will then be taking on a more active role in the operations of the business, with an emphasis on commercial new construction. I am proud to have grown up in and work for a company that excels at serving the Tallahassee community that I love so much. I am excited to be a part of the Chamber’s Access Tallahassee program, as the two organizations have one goal in common: working to make Tallahassee a better place to live and grow business in. For more information on Benson’s Heating & Air Conditioning, Inc. visit www.bensonshvac.com.